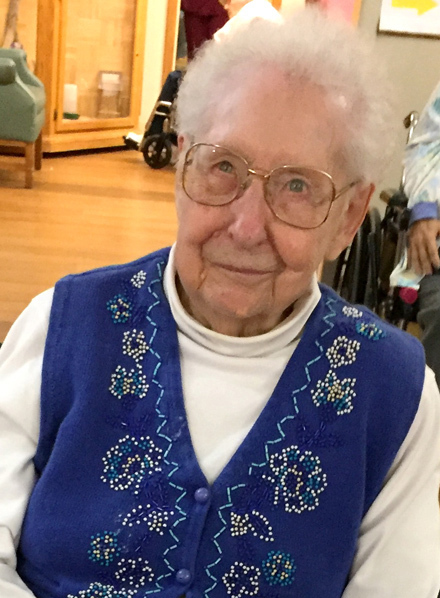 Isabel Anne Hansen Isabel Anne Hansen, 100, was born on November 5, 1918, and passed away March 25, 2019, at Mesa Manor Center in Grand Junction, Colorado. She is the daughter of Elfreda and Hans Peter Wilhelm Hansen. In 1919 the Hansen family moved to a farm south of Belleville, Kansas. Isabel attended elementary school at Grace Hill, a one room country school. She graduated from Belleville High School in 1937. Isabel took a test to teach elementary school after high school. She taught at the one room country schools named Grace Hill and Stony Point. She attended Emporia State Teacher College for a short time. She took classes through the years to enhance her work at Walgreen's. Isabel began working at Walgreen's Drug Store as a clerk and moved up to the corporate level over the years. She was headquartered in Peoria, Chicago and Danville, Illinois. She retired in March of 1986 and moved to Grand Junction, Colorado to be near her niece. Isabel was preceded in death by her only brother, Curtis and his wife Blanche, and one grand niece, Cortney Hansen Hatesohl. She is survived by five nephews: Joe of Belleville, Bill (Merry Jo) of Belleville, Larry (Sally) of Alliance, Nebraska, Dennis (Melba) of Belleville and Randy (Marcia) of Belleville and one niece, Joyce of Grand Junction. There are numerous grand nieces and nephews, great grand nieces and nephews and great great grand nephews and nieces. She has had four generations of support. Memorial Services will be held at 2:00 PM, Saturday, April 20, 2019 the Bachelor-Surber Memorial Chapel, Belleville, KS with Pastor Bruce Burfield, officiating. Inurnment will be at the Pleasant Hill Cemetery, rural Belleville, KS Memorial contributions can be sent to HopeWest Hospice, 3090 N. 12th Street, Unit B, Grand Junction, CO 81506 Online condolences at www.bachelor-surber.com Bachelor-Surber Funeral Home, Belleville, KS is in charge of the arrangements.